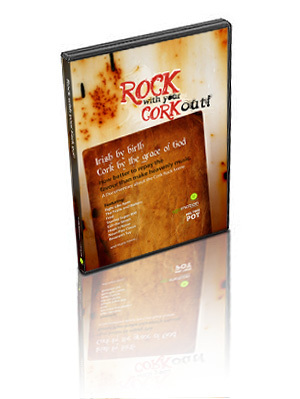 Rock with your Cork out DVD goes on Sale! Home / Rock with your Cork out DVD goes on Sale! Rock with your Cork out, the feature length documentary about the Cork Rock Scene goes on sale today at Plugd Records. The southern enclave of Ireland has long had the reputation for rebelliousness and when it comes to music we hate to disappoint. This happy band of rockers dedicate themselves to music with scant regard for trends, haircuts or market demographics. Despite tough times they’ve managed to create a scene where there is now a thirst for live music, an audience for diversity and, in a world where it’s all been done before, a fierce desire to hear something new, something real. footage and interviews with the people who make the scene happen including Stanley Super 800, Snowman, Exit the Street, Anacrusis, Hope is Noise, Fred, Neon Flea Circus, The Frank and Walters, Fight Like Apes and many more. This film is a must for anyone with an interest in New Irish Music or indeed any musician with hopes of being heard. This is the story of facing insurmountable odds and doing it anyway.